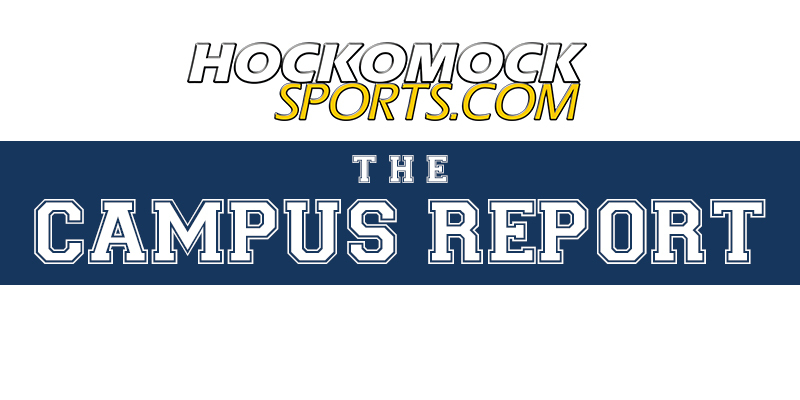 The HockomockSports.com Campus Report is an update on former Hockomock League athletes currently competing in collegiate sports. If you would like to submit an update, please e-mail info@HockomockSports.com. While David MacKinnon selected in the MLB draft earlier this month, two other former Hockomock players also had success in the America East this season. Brendan Skidmore finished a memorable career at Binghamton University, leading the Bearcats to a 30-win season. Skidmore, a Franklin graduate, started in 148 games in his four years as a Bearcat and recorded 152 hits, 117 RBI, 84 runs and 20 home runs. He posted an impressive .997 fielding percentage during his senior campaign. A broken wrist kept the former Hockomock League MVP out of postseason action. And at Maine, former Taunton ace Connor Johnson made a team-high 23 appearances for the Black Bears, who reached the America East Championship game. The southpaw posted a 4-4 record with one save in 39 innings of work, coming out of the bullpen for all of his appearances. He struck out 30 while allowing just eight extra base hits all season. Last year’s HockomockSports.com Girls Lacrosse Player of the Year Hana Caster had a terrific first year at UMass Lowell. She led all River Hawk freshmen with 22 points and notched 14 goals and eight assists on her way to becoming one of six River Hawks to record over 20 points this season, while leading the squad with 12 points (9g, 3a) during conference play. The midfielder was named to the America East All-Rookie team and finished the season third on the team in assists and draw controls (16), while her 17 ground balls tied for fifth best. 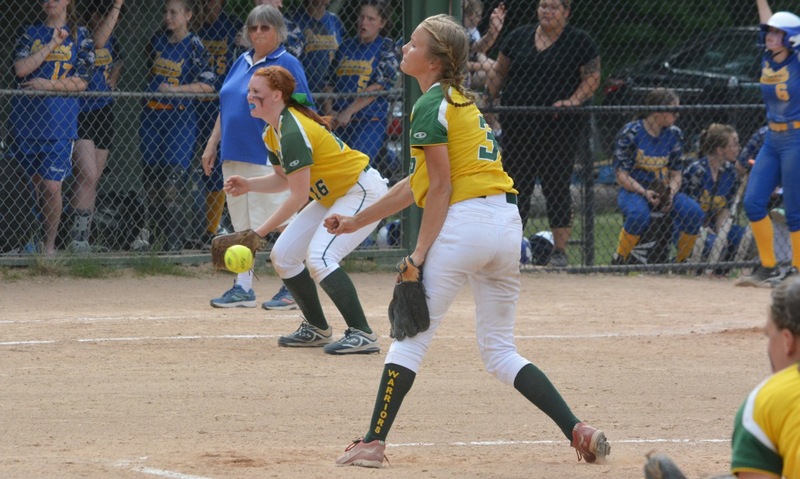 A pair of former Hockomock hurlers were both named to National Fastpitch Coaches Association All-Northeast Region teams for their work this Spring. North Attleboro grad Meg Colleran was named to the first team as well as the Atlantic 10 First Team All-Conference. Colleran was also named A-10 Championship Most Outstanding Player after helping UMass Amherst reach the final. On the season, she posted a 20-14 record with 22 complete games and a 2.60 ERA. King Philip alum Renee Poirier was selected to the third team, posting a team-best 2.19 ERA with a 14-8 record and five saves. She tossed 15 complete games in 21 starts with four shutouts and had two no hitters on the season (Columbia and Lafayette). She finished with 78 strikeouts on the season. Taunton graduate Aimee Kistner, last year’s HockomockSports.com Softball Player of the Year, was selected to the NFCA DIII All-New England third team for her tremendous rookie season at Western New England. On top of that, Kistner was tabbed Commonwealth Coast Conference Rookie of the Year and named to the All-CCC Second Team. Kistner hit .393 (33-for-84) with six doubles, one triple, four home runs and 27 RBI while scoring 24 runs and drawing 16 walks. She emerged as one of the top players in the CCC over the second half of the season, batting .568 (21-for-37) with four doubles, four home runs and 21 RBI in 14 games since April 11. She was also a top pitcher for the Golden Bears all season, appearing in 12 games with seven starts (four complete games), posting a record of 5-3 with a 2.53 earned run average and 44 strikeouts in 58 innings. The 2015 HockomockSports.com Player of the Year Kali Magane saw plenty of time in the circle for Boston University this spring. Magane tossed a team-high 155 innings as a freshman, striking out 70 while posting a 13-11 record. She had 11 complete games and one save. Milford’s Rachel Levine also saw a lot of time for the Terriors, starting in 39 games. She finished with a 0.240 batting average with 24 hits, including a home run, and 10 RBI. Levine also had an impressive 0.938 field percentage. Katie Notarangelo was named to the New England Women’s and Men’s Athletic Conference Women’s Lacrosse All-Conference Second Team for the first time in her career. Notarangelo, a starting midfielder for MIT, is 10th in the NEWMAC in draw controls (42) and as a midfielder she is fifth on the team in goals (23), points (29), groundballs (26), and caused turnovers (13). Former Panther Jared Trainor was second on the Wheelock men’s lacrosse team in scoring despite being just a freshman. Patrolling the midfield for the Wildcats, Trainor recorded 15 goals (second) and 14 assists (first) for 29 points. He also scooped up 26 ground balls with 38 caused turnovers. Luke Figueira, last year’s HockomockSports.com Baseball Player of the Year, saw plenty of action in his first season at the collegiate level with the Bentley Falcons. The Taunton graduate played in 34 games and was fourth on the team with 34 hits, batting .245. He added 10 RBI, 16 runs and one home run. Figueira had a seven-game hit streak in April and had a season-high four hits against Merrimack in early May. Taunton’s Kelly Reading had a successful sophomore campaign with Cedar Crest on the softball field. The former Hockomock League MVP batted 0.313 on the year, belting out 31 hits with 22 runs scored and eight RBI. She also stole four bases on the season while drawing a team-high 11 walks. She finished the season with 15 hits in the last 14 games. Sharon graduate Ryan Riley posted a 3-1 record during his sophomore campaign at Clarkson University. Riley started two games and made relief appearances in 11 more games. He recorded two saves over 28.8 innings of work, allowing 21 earned runs while striking out 25 – third most on the team. Riley finished the season with a five-inning outing, allowing just three hits and striking out five in a win against Union. Former Canton Bulldog Sam Sullivan was named to the Little East Conference Women’s Lacrosse First Team following a stellar season for Plymouth State. Sullivan has scored more than 50 goals for the second year in a row, just the second player in school history to achieve that feat. She has scored a team-high 53 goals this spring, fourth-most in the Little East, and ranks ninth in the conference with 61 points. A two-time LEC Offensive Player of the Week this spring, Sullivan was also named Most Outstanding Player in the Little East Conference Tournament. Milford’s Steve Morganelli had a solid senior season at Endicott, helping the Gulls win 25 games this season. The former Scarlet Hawk appeared in 33 games, recording 26 hits – including three triples, 15 runs and 17 RBI – posting a .310 batting average. Morganelli finished the season strong, notching two hits in three straight games and 15 hits in the last 14 games. Franklin graduate Nicole Ellin earned All-Liberty League Women’s Lacrosse Honorable Mention for the second straight year. Ellin started every game, leading Bard with 41 draw controls. She had 18 goals (on just 30 shots) and added two assists; two of her goals were game-winners, including the overtime goal that beat Nichols in March. A pair of former Hockomock rivals both had superb seasons up north at Keene State. Foxboro’s Connor Longley got it done at the plate and Sharon’s Nate Pederson was just as effective on the mound, helping the Owls make an impressive run in the Little East Conference. Longley was selected First Team All-Little East Conference as well as the D3Baseball.com Third Team All Region after batting .395 in 30 games with four home runs, 24 RBI and a .605 slugging percentage. On the mound, Pederson made 15 relief appearances for the Owls, tossing 30 innings while allowing just six earned runs (1.80 ERA) and striking out 12. Former North Attleboro star Mycala Moody continued her ways at Framingham State, earning MASCAC Softball Rookie of the Year and first team All-MASCAC honors. Moody batted .348 on the year with a pair of doubles, a pair of triples and 12 RBI. She also crossed the plate 21 times, stole 10 bases and had a .402 slugging percentage. Moody, who was selected as Rookie of the Week five times, was also named a Eastern College Athletic Conference Division III New England All Star. Canton’s Michael McMahon saw action in 16 games during his rookie season with Becker College’s baseball team. The former Bulldog recorded eight hits (batting .306), scored five runs and knocked in three runs with a pair of stolen bases. A pair of former Hock rivals teamed up to help the Bridgewater State women’s lacrosse team. King Philip alum Alex Lynch, a senior, scored 29 goals in 19 games played, adding seven assists for 36 points. Brooke Buckner, a junior and former Foxboro standout, finished with 12 goals and five assists, adding 19 ground balls and 35 caused turnovers. Canton’s Meghan Lennon and King Philip’s Jennifer Lacroix played pivotal roles in helping Endicott College claim the Commonwealth Coast Conference championship this season. Lennon, a senior, was named to the All-CCC First Team for the second time. After missing last season to injury, Lennon has started all 15 games for the Gulls thus far and currently leads the team in points (66), goals (41), and assists (25). Her 66 points is tied for the fifth-most in the CCC. Lacroix was also named to the All-CCC First Team and was named CCC Rookie of the Year – just the second Endicott women’s lacrosse player in program history to earn the honor. Lacroix is third on the team in points (47) for the most among rookies and tied for third overall in goals (32). Additionally, she is fourth on the team in assists (15) for the most helpers among the Gulls’ rookies. Lacroix leads the team in draw controls (72), which is good for fourth-most in the conference. She is second on the team in ground balls (28) and fourth in caused turnovers (14). Plenty of players dream of hitting the big hit to earn their team a big win, but former Foxboro Warrior Mike Slaby saw his dream turn into reality in the New England Collegiate Conference Baseball Championship in early May. Slaby’s fourth-seeded Lesley University and top-seeded Mitchell College were tied 6-6 in the bottom of the ninth inning. With the bases loaded, Slaby launched a game-winning walk-off grand slam to hand the Lynx the title. Slaby was named the tournament MVP for his heroics. On the season, Slaby led Lesley in at-bats (142), RBI (23) and stolen bases (10) while batting .289 during his senior season. You can watch Slaby’s walk-off grand slam below. King Philip graduate Malorie Knowlton was named to the Commonwealth Coast Conference women’s lacrosse All-Conference First Team following a great season for Curry. She made 17 starts and led the team and the conference in caused turnovers with 71. Knowlton finished second on the team and tied for third in the conference with 52 ground balls. She tallied 43 goals and dished out seven assists for 50 points which ranked her second on the team for both points and goals. Attleboro’s Kayla Merritt, a freshman, also started in 17 games and scored three goals, four assists and 25 draw controls. Two former Hockomock rivals completed their collegiate careers at Wheaton College this season. Franklin’s Rebecca Seifert was one of the team’s top hitters, batting .306 with 34 hits (both second on the team). Seifert was second on the team with 18 RBI and scored 30 runs in 36 games played. Milford’s Caroline Fairbanks had 21 hits on the season, including two home runs and 15 RBI, while leading the Lyons in walks. Fairbanks had 120 RBI in her four-year career at Wheaton. Foxboro alum Alex Pacitti concluded his lacrosse career at Saint Anselm this past spring, notching double figures in points for the second straight season. For his senior year, Pacitti scored 18 goals and added seven assists for a total of 25 points. He also had 25 ground balls this year. He finished his career with 43 goals and 62 total points. Former HockomockSports.com Player of the Year Max Lancaster continued his strong career at MIT with a stellar junior season. The Attleboro High grad batted .299 (sixth) on the season with 27 RBI, 10 stolen bases, five home runs, 11 walks and 31 runs scored to help the Engineers record 21 wins. Franklin’s Maegan Schmauder had the best offensive season of her collegiate career so far for RIT. A junior captain, Schmauder scored a career-high 20 goals this season with five assists. She also had 23 ground balls, 11 caused turnovers and 22 draw controls. Although just a freshman, Franklin graduate MacKenzie Pleshaw was one of top offensive producers for Stonehill women’s lacrosse. Pleshaw netted 29 goals and had two assists for a total of 31 points. She also had 15 ground balls during her rookie season. North Attleboro graduate Matt Hardy concluded a successful career with Nichols College with a strong season, helping the Bison earn 23 wins. Hardy was fourth on the team with a .309 batting average, starting in 40 games this season. He collected 43 hits, including eight doubles, knocked in 16 runs and posted a perfect fielding percentage. Carrie Long, who previously was a standout player for Foxboro, had a strong junior season for Fitchburg State and was named to the Eastern College Athletic Conference Division III North Women’s Lacrosse First Team. Long scored 27 goals (third on the team) and added seven assists for 34 points. She finished with a team-high 94 ground balls and 88 caused turnovers, while leading the nation in caused turnovers per contest (4.63) and being seventh nationally in ground balls per game (4.95) as of May 16th. Mansfield’s Kimmy Foley was also named to the MASCAC All-Conference First Team as well as the ECAC Division III North Women’s Lacrosse Second Team. Foley, a midfielder for Framingham State, tallied a team-best 56 points on the year which included 37 goals and 19 assists to go along with 54 ground balls, 46 draw controls and 22 caused turnovers. Canton’s Casey Bradley, a freshman, was just one of four players to start all 19 games for the Rams this season and recorded 26 ground balls. Former HockomockSports.com Baseball Underclassman of the Year Nick Santucci made a big splash in his first year at Rollins College. Just a freshman, Santucci appeared in 35 games, including 23 starts, and posted a .313 batting average. Of his 25 hits, eight were doubles and he knocked in 10 runs while recording a .923 fielding average. Franklin’s Samantha Jones was named to the Mountain East All-Conference Second Team after a tremendous freshman season for the University of Charleston. Jones started in all 13 games for the Golden Eagles, netting 24 goals and adding two assists. She also had 34 ground balls and 33 draw controls during her freshmen season. Although it feels like just yesterday that Shannon Smith was winning back-to-back state championships at Milford, the Massachusetts high school strikeout record holder concluded her career at Kentucky. In her senior season, she posted a 6-3 record, making 17 appearances and 11 starts. She had two complete games, striking out 55 batters in 50.1 innings of work. She limited batters to a 0.203 average with just five doubles allowed. In her collegiate career, Smith struck out 207 batters. Jack Vail, the only male athlete to win HockomockSports.com Player of the Year in consecutive seasons, is continuing his strong play at Springfield College. After getting his feet wet with with just three games played last year, Vail tied for a team-high 32 goals in 17 games played in 2017. He also recorded 16 assists, good for 48 points, while adding 28 ground balls. The only female athlete to win HockomockSports.com Player of the Year in consecutive seasons, Marta Versprille, had her best offensive production of her collegiate career during her junior season at Saint Anselm. Versprille scored 15 goals along with seven assists for 22 points, her career best in all categories. She also had 38 draw controls and 29 ground balls. Two Hockomock alums were a big part of Salve Regina’s pitching staff this season, helping the Gulls to 36 wins. Canton’s Jimmy Fitzgerald, who was named to the 2017 ABCA//Rawlings NCAA Div. III New England All-Region Second Team, posted a 6-2 record for the Gulls this season, striking out a team-high 73 batters with just 16 earned runs allowed in 52.1 innings of work (2.75 ERA). Sharon’s Will Ginsberg made nine appearances, including six starts, posting a 2-0 record with 37 strikeouts in 34.1 innings of work (3.15 ERA). Fitzgerald wasn’t the only former Hockomock standout to be on the 2017 ABCA//Rawlings NCAA Div. III New England All-Region Second Team: Taunton grad Matt Nunes was also on the list as a pitcher. Nunes, a star pitcher for Westfield State, posted a 6-2 record, including five complete games, a 2.04 ERA and allowed just 36 hits in 54.2 innings of work. North Attleboro grad Anthony Rinaldi posted a 3-1 record this season for the Endicott men’s tennis program. He went 2-0 at No. 5 singles and 1-1 at No. 6 singles play. He also went 1-0 in doubles play. He was named to the 2017 CCC Academic All-Conference Team. Former King Philip standout Brandon King continued to impress for the Clark University men’s lacrosse team. As a sophomore, King led the Cougars with 42 goals in the 2017 campaign. He also added eight assists, finishing with 50 points (second on the team). King was just one of three players to start all 18 games this season. Attleboro’s Hannah Smith had a very impressive junior season for UMass Dartmouth. Smith was the Corsairs’ top pitching option, tossing a team-high 157.0 innings while striking out 89 batters. She started in 23 games, earning 11 wins with 15 complete game efforts, posting a terrific 1.78 ERA for the year. Former Sharon Eagle Jacob Berish emerged as one of Skidmore College’s most reliable pitchers during his sophomore season. Berish was the lone pitcher on the team to post a sub 3.00 ERA, allowing just 12 earned runs in 39.2 innings of work (2.72 ERA). He had nine appearances – six of them starts – and posted a 2-3 record while striking out 21 batters. Brian Buckner had a strong rookie season with the Colorado Mesa men’s lacrosse team. The former Foxboro standout appeared in 14 of the team’s 18 games, helping the Mavericks to an 16-2 overall record. Colorado Mesa won its second straight Rocky Mountain Athletic Conference Tournament Championship with a 20-7 win over Westminster, a game that saw Buckner record his first two collegiate assists. Former Taunton girl’s tennis head coach Dave Purpura led the Bridgewater State Bears to a Little East Tournament Title this past fall and an NCAA tournament berth this spring. Another former Tiger, Alisha Silva, was the top singles player for the Bears, playing 18 matches at first singles. Mansfield’s Rachel Tarantino played 18 matches at No. 5 singles, recording six wins. After losing his first year to injury, former HockomockSports.com Player of the Year Brendan Welch, a redshirt freshman with Southern New Hampshire, finally got his first taste of collegiate baseball. Welch made 19 appearances, all in relief, and posted a 3-1 record with one save for the Penmen. It won’t come as a shock to former players to faced Welch but the left-handed pitcher struck out 27 in 23 innings of work. Sharon’s Spencer Aubin and North Attleboro’s Marshall Blackman both played pivotal roles for the Lyndon State men’s lacrosse program this spring. Aubin, a sophomore, started in 15 games, netting 28 goals (second on the team) as well as recording 18 assists (third on the team) for a total of 46 points (third on the team). Blackman was one of four players on the team to start in all 17 games, shoring up a strong defensive unit. Blackman had 36 ground balls on the year. Alyssa DeLuca, a King Philip alum, was named Midwest Women’s Lacrosse Conference (MWLC) Co-Attacker of the Year and was also a First Team All-MWLC selection. Also garnering first-team honors for a second straight season, DeLuca led the MWLC in goals scored with 77, ranking her sixth in all of NCAA Division III and also 15 more than the league’s next-closest player. She is also tied for the league-lead in points (84), ranked 15th in draw controls (40). DeLuca set a school record with 10 goals in a single game back in April. Attleboro’s Nate Tellier had no problem making the transition from high school to college, based on his production in his first season with UMass Dartmouth. Tellier led the Corsairs in at-bats (177) and stroked 52 hits – nine doubles, two triples and two home runs – with 18 RBI total. He led the team with 27 stolen bases and posted a .294 batting average. While making just seven appearances on the mound (7.2 innings), Tellier only allowed two hits with nine strikeouts and no runs allowed. Former Mansfield Hornet Zac Courier also enjoyed a nice season, batting .310 with 19 RBI and three home runs, playing in 30 games. Former Oliver Ames standout Lexi Soucie had a strong senior year at the plate at Salve Regina. Soucie was fourth on the team with 33 hits, batting .311 with a .387 slugging percentage. Her eight doubles were tied for the team lead, and she added 23 runs scored and 12 RBI and 11 stolen bases. For her career, Soucie had 159 hits at Salve Regina and a career batting average of .322. Canton’s Carly Scanlon posted an impressive 13-1 record in singles action for the Regis women’s tennis team. After starting the season 1-1, Scanlon rattled off 12 straight wins, including the last two in April. Another former Hockomock tennis player, Emma Prinos, had a strong season in singles action for Stonehill College. Prinos went 10-6 playing at a variety of different singles spots for the Skyhawks. Prinos rattled off seven wins in a row back in the fall. Taunton’s Mollie McCaffrey went 8-6 for UMass Dartmouth over the past year, including a 5-0 record at third singles. King Philip alum Jake Cavanagh had an immediate impact during his freshman year with Utica College. He made four appearances out of the bullpen for the Pioneers, posting a 2-2 record in 18.1 innings of work, striking out 13 with just 10 earned runs allowed. After setting the record for hits at Oliver Ames, Mike Ferrara has continued to rake at Worcester State. A sophomore, Ferrara was third on the team in at-bats (149) and posted a .322 batting average with 48 hits this season. Of his 48 hits, six were doubles and four were home runs, totaling 30 RBI for the year with a pair of stolen bases. Former Franklin goalie James Keane had a strong year for Nichols College. Keane started in nine games this season, making 12 overall appearances, and posted a 7-3 record. He made 107 saves with a .601 save percentage and a 7.18 goals against average. North Attleboro alum Pat Nally won 51 face-offs, second most on the tam, in 18 appearances in his rookie season. Milford graduate Allie Piergustavo was a reliable option for the St. Bonaventure softball squad this season. Piergustavo started in all one but game for the Bonnies this spring, recording 38 hits (second on the team) for a .273 batting average. She added seven doubles and six home runs, scoring 15 runs with a team-high 29 RBI. She had a team-high 316 putouts with a .976 fielding percentage. Attleboro struggled through a difficult 2016, the first season under new head coach Mark Homer, winning only two games while giving up a league high 177 runs and scoring a league-low 46. Heading into this spring, the Bombardiers will be counting on a group of young players to try and turn things around and it seems to be working so far, as Attleboro has played two games and already matched last year’s win total. One of the true bright spots from last season was freshman pitcher McKenzie Bergdoll, who showed flashes of the potential to be an ace for Attleboro, and this season she will be counted on to keep the Bombardiers in games and to provide big hits from the three-spot. Julia Woyton will be behind the plate this year while senior Ilea Caverley and junior Casey Whelan (outfield) and Jordyn Lako (second base) are the few returning players on the roster. The Bombardiers are going to turn to youth this spring with freshman MacKenzie Killough taking over at shortstop. Freshmen twins Emma and Jenna Gittle will add depth to the Attleboro pitching staff and classmate Ashley Macia will take over in centerfield. Homer also said that there were underclassmen who would provide speed off the bench. Former King Philip and Sacred Heart University shortstop Jennifer Robillard takes over the Canton program this spring with the hope of bringing some of the success that she enjoyed playing for two state champions and a Division I college to the Bulldogs, who are coming off a three-win season. The Bulldogs will be looking to their experienced players to help turn things around in 2017, including seniors Molly Loughran, Taylor Carrington, and Julia Ezepik and junior Hannah Jerrier, who are all captains this spring. Jerrier and Ezepik will start the season injured, but Robillard is hoping that other players can step up until they return. Canton will have depth in the circle, as both junior Caitlyn Cahill and freshman Caroline Hughes will see action at pitcher. In 2016, Foxboro finished 6-10 in the Hockomock League but got its chance to play in the postseason and took advantage with a preliminary round win over Westwood and a near-upset of Abington in a nine-inning classic. The Warriors will hope to build on that experience this spring with a number of key players returning. League all-star Hannah Davis is back behind the plate for the Warriors and will be one of the top hitters in the Hockomock. Davis will likely be in the three-spot in the lineup and right behind her will be senior Kelly Fisher, who head coach Mark Maguire called one of the best first basemen in the league. Kelly McCarthy will try to set the table for the power hitters in the lead-off spot. Sophomore pitcher Emma Rohan is back in the circle and Maguire expects that she will compete every game and build on her rookie campaign. Behind Rohan, Cam Willis will moved from second base to short and Chelsea Gibbons will provide good ‘D’ and a solid bat at third. Lefty Lexi Buckner could grab the second base spot and senior Jamie Gorham could provide an unexpected boost as a first-year player in the outfield. Mandy Ryan and Kayla Wheatley are two of the players coming up from JV that Maguire is hoping will step in to provide depth. Once the rains go away for a few days, Franklin will be able to open its new field and make official its move back to the high school after a couple seasons playing at Dean College. The Panthers are excited about the new facility and about the team’s potential for success this spring with seven returning starters from last year. Leading the way is third baseman, and four-year starter, Olivia DiGiacomo, who has been a mainstay at the hot corner and provides leadership for the infield. To her left is shortstop Alyssa DaSilva, a three-year starter with two years of experience at short. Sophomore Allie Shea is back at first base and senior Clara DeCarvalho is back behind the plate and poised for a “breakout season,” according to head coach Kate Fallon. The outfield is also filled with veterans, including seniors Rachel Cousineau in left and Olivia Haba in center. The seventh starter is senior Alex Niss, who started as a pinch hitter last season before taking over the DP role and turning into one of the top power hitters in the Hockomock League. The Panthers should be solid defensively and at the plate and Fallon is hoping that sophomore pitchers Jackie Cherry (who carried a shutout into the seventh in the season opening loss to North Attleboro) and Emily Valentino can make an instant impact in the circle. King Philip comes into 2017 on the back of its third state title in the past six years and, while expectations remain high for one of the region’s top programs, there are key pieces from last year’s team that need to be replaced in order for the Warriors to get back on top in the Kelley-Rex division and in the state. The biggest absence this season is, of course, pitcher Kali Magane, who is now in the circle for Boston University and who was dominant during KP’s playoff run a year ago. Senior Jenn Hutnyan will step in to be the team’s starting pitcher after several starts and relief appearances in the past two seasons. Hutnyan will also be an important bat in the lineup. Junior Brie Lacy will be back behind the plate to help Hutnyan and head coach Norm Beauchemin noted that junior Jessica Bonner will be a solid defensive third baseman. KP rarely rebuilds and almost always reloads for another title push. This year should be no different with a lineup that features several familiar names from last season’s title run, including sophomore Meghan Gorman and juniors Brooke Taute, Elise Pereira, and Hailey McCasland. Each of those players had important roles last season and will be ready to step up for the Warriors this spring as KP tries to regain the league title after Taunton ended its nine year run in 2016. Mansfield is coming off a 13-win season that included a tournament win against Notre Dame Academy, but after four years of being able to count on Maddie Letendre in the circle the Hornets will be handing the ball over to a new pitcher this spring, although as it turns out only the first name will be changing. Megan Letendre, who played shortstop as a freshman, will take over in the circle for the Hornets and her development as the No. 1 pitcher will go a long way to determining if Mansfield can repeat last year’s success. Pitcher is not the only position that needs to be replaces, as the Hornets will have a new catcher and three new infielders. Still, with nine returning players, there is plenty of experience on the roster. Kara Bendanillo will move from third base to second, according to head coach Lori Letendre, and Megan Letendre will sometimes see time at second when not pitching. Liz Mackin will take over at first base, while Marissa Staffier and Amanda Giambanco will take the corner outfield positions. Mady Bendanillo will be back in center after an impressive first season for the Hornets. “This is one of the hardest working teams I have had at Mansfield and they have been putting in a lot of effort to get ready for the season,” said Coach Letendre. Milford has been the class of the Davenport division for the past four seasons and the Hawks come into 2017 with the expectations of being heavy favorites for another league title, but, with three seniors and nine juniors on the roster and eight starters returning, head coach Steve DiVitto is hopeful that the talent will translate to a deep run in the state tournament. The Hawks are one of the few contenders to return not just one but two starting pitchers from last season. Senior Ali Atherton is back to be the primary option in the circle and the Southern New Hampshire-commit has been dominant at times in her career. If Atherton gets into trouble or needs a rest, junior Kelley Reichert has demonstrated that she is more than just a fill-in but can also shut down opponents. They will be pitching to sophomore Emily Hartman, who will step into the starting lineup this season. There are very few question marks in this year’s lineup with junior Emily Piergustavo moving from second to short to replace Jill Powers, which is Piergustavo’s natural position and one she has played several times in the past year. Junior Jess Tomaso is back at first base and in the heart of the lineup where she will be joined by senior outfielder Maggie Farrell and senior third baseman Kaitlyn DeCapua. Junior Kate Irwin will try to be the table-setter at the top of the order and juniors Maddy Bonvino (second base) and Shannon Cormier (outfield) will also be contributors. North Attleboro returned to the postseason in 2016 and for the Rocketeers to get back to the tournament this spring it will be the younger players that will lead the way. Head coach Bill Wallace knows that his team will be “green” (with only four seniors on the roster), but he is excited about North’s athleticism and versatility. Pitching may be North’s biggest strength this season with five players in the rotation, led by freshman Bella Erti, who won her first career start, and last year’s starter Amelia Murphy. Juniors Olivia DesRoches, Jaclyn Buckley and Abby Warren could also step into the circle to help out. Senior Sam Courtemanche will be behind the plate to help the pitchers. Senior Liz Morehouse returns at first base and Andrea Miceli will be at second. Megan Barlow moves in from the outfield to take over at short (and provided the walk-off hit in North’s season opening win), while Murphy will see time at third when she’s not pitching. Olivia Capobianco will play center with Katherine Munley and Kristina Murphy in left and right with freshmen Ashley Cangiano and Abby Gallagher getting playing time. Oliver Ames finished in second in the league in 2016 and qualified for the postseason, but that will be an even tougher task now that the Tigers have made the move to the Kelley-Rex division. Even with facing the likes of defending state champion King Philip twice this spring, head coach Lindsey Allison is optimistic that the 10 returning players have the experience to get back into the playoffs. Senior Victoria Ziner will be the spark on offense for the Tigers this season, but OA also has a number of juniors that Allison said can “do some damage at the plate.” Among those players is Caroline Mahoney, whose bat “is still as dangerous as ever,” according to Allison. Freshman Katie Abreu will be a newcomer to watch for the Tigers as her versatility will make her a valuable member of the lineup. The Tigers will bring back sophomore Kayla Georgeu in the circle and will be hoping that she continues to develop and keep OA competitive against the league’s top teams. Junior Alexis Campbell will be a second pitcher and also help out at second base. Sharon is coming off a four-win season in 2016 but head coach Deb Parker believes that the Eagles have the potential to be a contender in the Davenport division this spring as long as the players continue to develop over the course of the season. Sophomore centerfielder Rebecca Clayman and shortstop Ally Small, who Parker referred to as “standouts,” will be the anchors of the defense. Freshman Shoshanna Lowe will step in to play third base and should have a positive impact in the lineup as well. The Black Knights made a return to the state tournament in head coach Tim Norton’s first season in charge, and nearly pulled out a win against Braintree, and Stoughton will be counting on last year’s freshmen to continue developing and keep the program heading in the right direction. One of the sophomores that the team will be leaning on is third baseman Jordan Lyons, who brings a strong bat to the hot corner and her leadership skills had her named a captain for this spring. Brianna Ferrandiz will take over behind the plate for Sam Tullis and Karly Estremera will move into the infield and continue to be the table-setter as the leadoff hitter. Norton is excited to have depth in the circle with Shannon Flaherty and Gina Carafa both capable of racking up innings and “setting great examples on and off the field.” Stoughton will also have depth in the outfield with first-year starters Krista Michienzi, Val Whalen and Alessandra Loffredo. Last season, Taunton won its first outright league title, ending King Philip’s nine-year reign atop the Hockomock. It was a fitting coda to the impressive careers of Taunton’s senior class, but this spring the Tigers will now have to move forward with six new faces in the starting lineup, including at pitcher and the middle infield positions. Taunton typically reloads quickly and head coach Dave Lewry believes this year’s team has a plenty of potential. Senior Courtney Fisher will step into the circle hoping to make a seamless transition from 2016 Player of the Year Aimee Kistner. Fisher tossed three shutout innings and had three hits in the season opener and got several opportunities to pitch in the past two seasons. She will be pitching to junior captain Kya Enos, who is making the move back to catcher after two seasons in the outfield. Other starters coming back include first baseman Katie VanZandt, junior outfielder Liana Duarte, and sophomore Jaime Brown, who is in her third year at third base. The Tigers have always found young players who can step right in an make an impact at the varsity level and this year could be a breakout season for eighth grader Hannah Aldrich, who will take over from Jordan Wade at short. Sophomore Alexa White looks ready to step in at second, while senior Rebekah Lajoie and junior Hailey Medeiros are in line to start in the corner outfield places. Taunton could also get contributions at pitcher from eighth grader Kelsey White and freshman Jaylin Couto. Click here for the 2016 HockomockSports.com Softball Awards. WORCESTER, Mass. 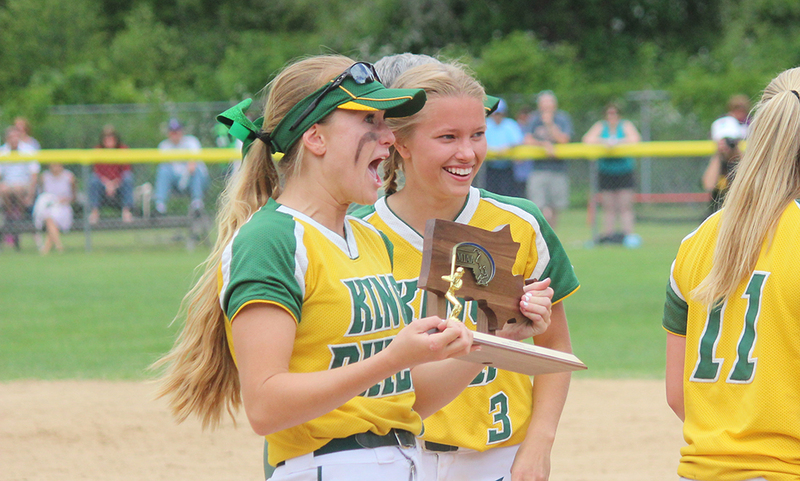 – The Division 1 State Championship game was certainly far from over when King Philip took a 1-0 lead over Doherty the top of the first inning. But with Kali Magane in the circle and the way that she’s been pitching in the postseason, it sure felt like more than just a one run cushion. 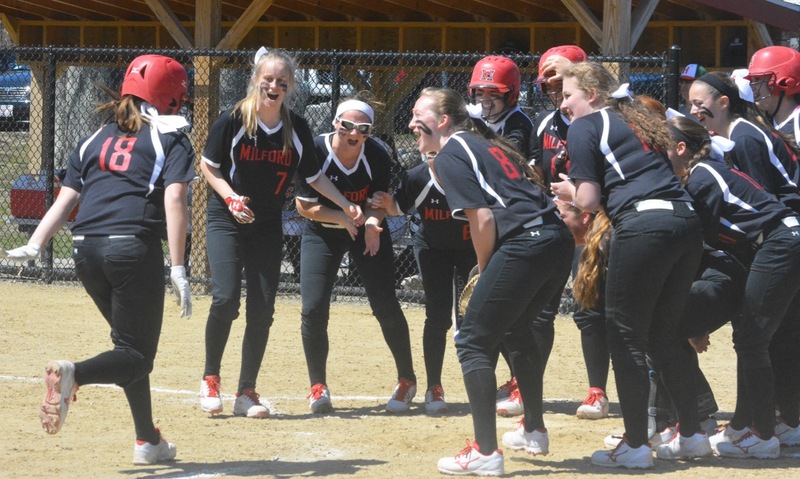 The confidence level grew after the Warriors tacked on another run in the top of the third and then peaked when Jenn Hutnyan launched a three-run home run in the fifth inning. Magane did the rest, tossing a one-hit shutout with 13 strike outs, fanning the side in order in the bottom of the seventh, punctuating King Philip’s 5-0 win to claim the Division 1 State Championship. It marks the third D1 State Title in the past seven years for the Warriors. Senior Christa Wagner started the game with a leadoff single and quickly took second with her first of three stolen bases of the game. Hailey McCasland advanced Wagner with a ground out and Elise Pereira’s contact was deep enough to center to score the run on a sacrifice fly. Wagner reached on a fielder’s choice in the third and promptly swiped second and third, just beating the throw to third. Doherty pitcher Peyton Sylverster saw her pitch elude catcher Emma Brennan and Wagner took advantage, sprinting in to make it 2-0. Magane was dominant from start to finish. Doherty’s lone hit was a leadoff single in the top of the second inning and a runner reached on an error in the fifth but neither advanced past second base. Magane retired the side in order in the first, third, fourth, sixth and seventh innings and recorded a strikeout in every inning. “She’s a tremendously smart pitcher. She knew where their weaknesses were and she attacked it,” Beauchemin said. The Warriors put the proverbial nail in the coffin in the top of the fifth inning. McCasland singled and Pereira drew a two-out walk to put two on. Hutnyan, who had made contact in her first two at-bats but was without a hit, fell behind Sylvester 0-2. But that did’t stop the junior from connecting on the next pitch, smacking a bomb over the left center field fence and putting KP up 5-0. Magane was at her best following the home run. After the error to start the fifth, Magane fanned three straight. She induced an infield pop up and grounder to third before getting his 10th strikeout to end the sixth. She finished off the season with three straight swinging strikeouts to earn the championship. The Warriors totaled nine hits with Wagner, McCasland and Gorman each having two and Caeli Bench, Brooke Taute and Hutnyan each adding one. King Philip softball finishes the season with a 24-4 record, and were quick to credit their schedule as a reason they were ready to play today. Over the past 10 years, teams that now reside in the Hockomock League have won the D1 State title six times. Taunton won in 2007 before joining the league, Milford won back-to-back in 2012 and 2013, the latter their first year in the Hock and King Philip won in 2011, 2012 and now 2016. The Warriors also loaded their non-league schedule up, including Bishop Feehan and Newton North. Ryan Lanigan can be contacted at RyanLanigan@hockomocksports.com and followed on Twitter at @R_Lanigan. Below are the official Hockomock League Softball All Stars. TAUNTON, Mass. – Top-seeded Silver Lake entered Sunday’s D1 South Sectional Final allowing less than a run per game on average and had just one run against in three playoff wins so far. That certainly didn’t phase the seventh seeded King Philip Warriors. KP scored a pair of runs in the first inning, added two more in the fourth and tacked on one more in the fifth to get a 5-2 win over the Lakers and the team’s first sectional title since 2011. The Lakers, who had been unbeaten at 23-0 (25-0 if you include exclusion games) coming into the game, had only allowed more than one run in three games this season and allowed more than two runs just once, a 5-4 win in April. Sophomore Elise Pereira got things going in the first inning after Lakers pitcher retired the first two Warrior batters with swinging strikeouts. Pereira’s grounder rolled along the first bast line, was bobbled by the Lakers catcher and the throw was off the mark. Junior Jenn Hutnyan followed with a single through the left side of the infield to put runners on first and second. Senior Caeli Bench came in clutch with a single to score Pereira from second for a 1-0 lead. Sophomore Brooke Taute followed suit with a slow roller down the third base line for an infield single RBI to make it 2-0. Kali Magane’s single loaded the bases for KP but Silver Lake pitcher Maddy Barone was able to induce a pop fly to right. Despite leaving the bases loaded, the damage was done for KP. While Barone retired KP in order in both the second and third, Magane worked around a one out double in the bottom of the first and retired the side in order in the second. Silver Lake was able to draw within one in the bottom of the third. Madeline Critch led off with a single and moved to second on a sac bunt. Critch then used a pair of wild pitches to get to third and then home to cut the lead in half. But KP was quick to answer, stretching the lead to three by plating a pair of runs in the top of the fourth. Taute started the top of the fourth with a double and moved to third when Magane lined a single down the left field line. Barone got a ground out by Gorman came through with her first RBI hit of the day, this one a double into left center to bring Taute and move courtesy runner Jessica Bonner over to third. Senior Christa Wagner drove a pitch to center, deep enough for a sacrifice fly to make it 4-1. After retiring the side in order in the fourth, Magane allowed a lead off walk in the bottom of the fifth but responded with back to back strikeouts and then got a ground ball to third for the third out. That gave KP enough momentum to tack on another run in the top of the sixth. Taute was the catalyst once again, this time leading off with a walk. Magane grounded out to the shortstop but Taute advanced to second. Gorman connected with her second RBI hit of the day, this one into the outfield deep enough to bring Taute home to make it 5-1. Silver Lake turned a lead off single into a run in the bottom of the sixth but Magane induced two fly balls in foul territory, caught by Pereira at first, and a grounder to Ashley Hession at short to finish the inning. It was business as usual in the final inning for Magane, getting a line out to Hutynan at third, who made a nice grab, a swinging strikeout — her seventh of the game — and then got a grounder to short for the sectional final winning clinching out. “It’s been five years since the team has won the South sectional, so this is a big win,” Beauchemin said. 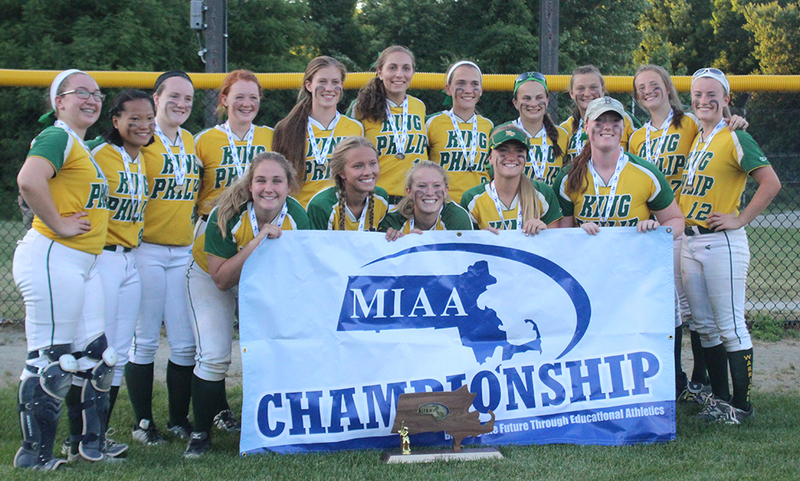 King Philip (22-4) advances to the Division 1 State Semifinal to play the North champion, Lexington. Lexington (20-4) defeated Newton North 2-1 in eight innings in the North sectional final. KP and Lexington will play for a spot in the state finals on Tuesday, at Martin Field in Lowell at 7:00. TAUNTON, Mass. 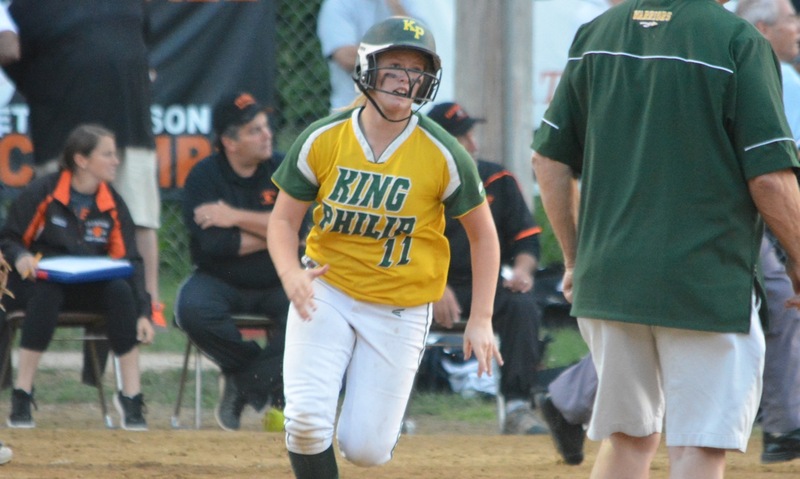 – Over its last two tournament games, the formula for King Philip softball has been simple: jump out to an early lead then hand it over to pitcher Kali Magane to shut down the opposition. That formula worked against division rival Taunton on Monday, and it was successful again on Friday night as the Warriors topped Hopkinton 4-0 to advance to the Division 1 South final. Against Taunton, it was Ashley Hession who powered KP to a 3-0 win with a three-run blast in the second inning that accounted for the only runs of the game. In the second inning of Friday’s game, the Warriors played small ball to race into the lead. Jenn Hutnyan led off the inning with an infield single on a liner that was knocked down by Hopkinton pitcher Brianna Maribile but the throw was not in time. Magane followed with a hard hit line drive to left center, and after a Hession walk, Meghan Gorman drove in the first run on a shot that spilled out of the glove of the lunging center fielder Lillian Morningstar. Magane did not allow a baserunner until Morningstar led off the fourth inning with a single. Kaitlyn Holly then attempted a bunt to move the runner over, but the third baseman Hutnyan made a diving grab for the first out. Magane then induced a strikeout and pop out to end the inning. In the fifth inning, the Hillers again threatened but could not score. After two KP errors placed two Hopkinton runners in scoring position, Magane escaped the jam with another strikeout-pop out combination. Hopkinton had one final chance in the seventh inning, compiling back-to-back singles before Magane ended the game on her ninth strikeout of the night. Magane has racked up nine strikeouts in each of her last two tournament starts, and her offense has supplied just enough production to secure the wins. Despite the stagnant offense, Beauchemin believes his team’s formula can still be successful going forward. It will be a quick turnaround for Magane and the Warriors, as they will face top-seeded Silver Lake on Saturday at 7 p.m. at Taunton High School in the D1 South Final, but Beauchemin is confident that his team will be ready. TAUNTON, Mass. – Taunton won both meetings with King Philip during the regular season (by the same 2-0 score line) and ended the Warriors’ nine-year run as Hockomock League champions. The Tigers held bragging rights on their division rivals…right up until Monday night. The third time proved to be the charm for the Warriors. Kali Magane struck out 11 and allowed only three hits and fellow senior Ashley Hession blasted a three-run homer in the second inning to lift KP to a 3-0 victory in the Div. 1 South quarterfinal at Jack Tripp Field. The defining inning began with a leadoff walk by Brooke Taute and a single by Caeli Bench that put two on with no outs. Taunton pitcher Aimee Kistner got a line out to left and another line drive right back to the circle to give her a chance of escaping the jam, but her two-strike rise ball to Hession caught too much of the plate and the St. Joseph’s commit deposited the pitch over the left field fence. Magane dominated the Tigers from start to finish and made sure that Hession’s one swing was enough to earn the win. She struck out the side in the top of the first and struck out two hitters in an inning twice. The Tigers got a two out walk in the second, but did not get their first hit until the fourth on a single by Meghan Navarro, which followed Kistner’s walk and was the only time that Taunton had more than one base runner in an inning. Magane stuck out Kya Enos and got Sarah Bagge on a soft liner over second that Hession chased down to end the threat. “She beat us tonight. There’s no doubt about it,” said Lewry. “We didn’t even hit her well in the two games we won; we just got enough bats on the ball to score a couple of runs. Taunton also got a hit from Katie Van Zandt with one out in the fifth, but the inning ended when Liana Duarte grounded to second baseman Meghan Gorman who turned a 4-3 double play. That was the last Tigers base runner, as Magane retired the final seven hitters. Kistner had a rough start to the game but seemed to get stronger as the innings wore on and turned it into another pitcher’s duel. She limited the Warriors to just two hits after the second inning (a single in the fifth and one in the seventh) and finished with three strikeouts, including back-to-back K’s to end the sixth. Lewry added that he is going to miss the influence of seniors Jordan Wade, Navarro, and Kistner, who have played at least four years on varsity and won a pair of league titles. King Philip (20-4) will face the winner of Hopkinton/Walpole on Wednesday at 5 p.m.
PLAINVILLE, Mass. – King Philip seems to have Norwood’s number in the state tournament. Behind a stellar performance from senior pitcher Kali Magane, 10 strikeouts and just three hits allowed, the Warriors beat Norwood 5-0 on Saturday afternoon at the Plainville Athletic League complex. It is the third time in four years that KP has ended the Mustangs’ season. Magane was dominant in the circle on Saturday. She allowed a lead-off single off the centerfield fence to Taylor Reed in the second inning, but that was the lone hard hit ball. She struck out two in an inning four times and overpowered the Norwood hitters. “There’s nobody better than her,” said KP coach Norm Beauchemin. “There weren’t too many balls hit hard. The Mustangs did put together a rally in the fourth inning but a controversial call when Brianna Lacy caught the Norwood runner trying to steal third effectively ended the threat. Magane allowed a runner to reach on a throwing error in the fifth but followed it with back-to-back strikeouts to end the inning. In the sixth, she allowed a one-out single but retired the final two hitters and then closed the game out in style by striking out a pair in the seventh to reach double digits for the game. The KP offense came through with a big second inning to give its pitcher a little cushion. Caeli Bench doubled down the left field line and Jenn Hutnyan (3-for-3) dropped a bloop into shallow left. With one out, Ashley Hession singled to right to plate the first run of the game. Meghan Gorman lined to the second baseman for the second out but the Norwood player tried to turn it into a double play and the throw got away to allow a second run to score. Christa Wagner (2-for-3) drove in the third run with a bunt single. KP tacked on a run in the fourth inning when Hutnyan lined a solo homer over the fence in center. The Warriors had a golden opportunity to add another in the fifth after Wagner tripled to lead-off the inning, but she was thrown out at the plate on a grounder to second. In the sixth, the Warriors did add an insurance run. Sydney Phillips (who entered the game as a defensive replacement in the top half of the inning), Bench, and Hutnyan singled to start the inning and Magane brought in a run with a sacrifice fly to right. With the win, KP advances to the Div. 1 South quarterfinal and a possible matchup with division rival Taunton (the Tigers played Somerset-Berkeley on Saturday night). Magane admitted the team was looking forward to another chance to face the Kelley-Rex champions, who won both regular season meetings with the Warriors. King Philip (19-4) will play next on Monday against the winner of Taunton/Somerset-Berkeley. Attleboro, 2 @ North Attleboro, 0 – Final (8 inn.) – Click here for a recap of the game. Click here for a photo gallery from the game. Foxboro, 1 @ Oliver Ames, 4 – Final – Oliver Ames’ Zach Sato, Kevin Geary and Michael Mulrean combined to limit the Foxboro Warriors to five hits to get the Tigers’ 10th win of the season. OA scored three runs in the bottom of the fourth behind a Chris Pearsons single and a two-run double from Matt Mancini. Kyle Gagliardi and Pearsons each had two hits for the Tigers. King Philip, 9 @ Franklin, 5 – Final – Click here for a recap of the game. Mansfield, 2 @ Taunton, 0 – Final – Click here for a recap of the game. Stoughton, 1 vs. Whitman-Hanson, 2 – Final – Stoughton’s Ryan Sullivan pitched well, going the distance, allowing just two runs on six hits with three strikeouts. Jack Connelly drove in the Black Knights’ only run while Luke Johnson went 2-2 with a walk. Attleboro, 2 @ North Attleboro, 8 – Final – Amelia Murphy fanned 13 batters to help North Attleboro claim the Blue and Red Cup. Mycala Moody was 2-3 with two RBI, Kaylea Sherman and Gina Miceli each had an RBI single, Tess Munley added an RBI, Jordan Sharpe two hits and Carolyn Wallace made a nice play with a pick at first, helping the Rocketeers prevent a pair of runs. Sharon, 3 @ Canton, 12 – Final – Sarah Reissfelder had a trio of triples and seniors Caitlin McCarthy, Rachel Dooly, Colleen Phelan, Aoife Omahony and Gab Matthews each had hits for the Bullldogs. King Philip, 3 @ Franklin, 0 – Final – King Philip’s Kali Magane allowed just one hit while retiring 14 batters via strikeout to lead the Warriors to a shutout win. Meghan Gorman had a pair of hits and used excellent base running to score a run for KP. Canton, 8 @ Milton, 4 – Final – Freshman Mike Shaw led Canton with a pair of goals and had one assist and freshman Griffin Roach scored his first career goal in his first varsity game. King Philip, 5 @ Westwood, 9 – Final – King Philip outscored Westwood 4-0 in the fourth quarter but their rally fell short against the Wolverines. Paul Macrina made 16 saves in the cage for the Warriors while Sam Agricola (three goals), Tim Watson (goal, assist), Harry Fallon (goal) and Colin Devellis (goal) paced KP’s offense. Taunton, 1 @ North Attleboro, 9 – Final – Taunton’s Kyle Hebert scored off an assist from Andrew Wellington. Oliver Ames, 10 vs. Pembroke, 6 – Final – Senior Jake Aronson made 11 saves in net and sophomore Owen Gallagher recorded five points as the Tigers punched their ticket to the postseason. Gallagher had four goals and one assist, senior middie Max Bamford had a pair of goals and assists, sophomore attack Eric LeBlanc scored two goals, senior middie Connor Howe scored once and senior middie Aidan Connly found the back of the net once and added one assist. Oliver Ames, 10 @ Pembroke, 8 – Final – Ariana Waldorf pushed aside 18 saves in the cage for Oliver Ames, who held off Pembroke. Erin Fitzgerald led the offense with four goals and one assist, Hannah Friend scored twice and Abby Duvall had a goal and an assist. Sam Lang, Carly Cidado and Kendall Clifford each scored once for OA. The Tigers’ defense was led by a strong effort by Katie Davenport. North Attleboro, 19 @ Taunton, 1 – Final – Kenzie Rosenberg netted four goals, including her 100th career goal, for the Rocketeers. Sophomores Camille Pizarro, Julia Takin and Julia Tolfa each scored twice for the Rocketeers. Chloe Olsen also chipped in with three assists for North. Attleboro, 0 @ North Attleboro, 5 – Final – North Attleboro senior Mitchell Dyer battled to a 7-5, 6-3 win at first singles, senior Jake Fontes didn’t lose a game in a 6-0, 6-0 sweep at second singles and senior Ben Lacasse won 7-5, 6-0 at third singles. Seniors Jeff Yao and Nick Lockavitch won 6-1, 6-4 at first doubles and seniors Duncan Pickett and Ben Scott won 6-2, 6-4 for Big Red. Canton, 0 @ Sharon, 5 – Final – The Eagles completed yet another undefeated league season with a sweep over Canton. Griffin Fein won 6-3, 6-3 at first singles but both Fred Bondar and Tilak Mehta had to battle back from a lost set to get wins. Bondar prevailed 5-7, 6-1, 1-0 (10-4) at second singles and Mehta won 6-3, 6-7, 1-0 (10-4). Adam Dobbin and Alex Romantz didn’t drop a single game in a 6-0, 6-0 sweep at first doubles and Andrew Tarnoff and Jing Huang won 6-0, 6-3 at second doubles. Sharon, 5 @ Canton, 0 – Final – Sharon completed an undefeated regular season with the sweep. Lulu Yuan and Nupur Shulka both swept 6-0, 6-0 at first and second singles, respectively, while sophomore Emily Wen won 6-1, 6-0 at third singles. Pooja Puttigampala and Katie Merport didn’t lose a set in a 6-0, 6-0 win at first doubles and Sydney Gordon and Sophia Fein won 6-3, 6-2 at second doubles. Oliver Ames, 1 @ Foxboro, 4 – Final – Neither Diana Prinos or Lexi Nelson lost a game, winning at first and third singles, respectively, for Foxboro in the win. Sophia Prinos picked up a 6-1, 6-0 win at second singles and the team of Michaela McCarthy and Julia Muise won 6-4, 7-5 at first doubles. Oliver Ames’ Claudia Ferrara and Rachel Stryke won 6-2, 6-3 at second doubles. Taunton, 2 @ Mansfield, 3 – Final – Needing a win, Mansfield’s three singles players carried the Hornets to a berth in the state tournament. Paulina Martin picked up a 6-1, 6-1 win at first singles, Kathleen Giffels won 7-5, 6-3 at second singles and Sarah Doyle notched a 6-1, 6-3 win at third singles to clinch the win. Taunton’s Ashleigh Eason and Emily Moor won 6-2, 6-4 at first doubles and Caroline Hebert and Jillian Pagliuca won 6-1, 6-2 at second doubles for the Tigers.